Add the potatoes to a large bowl. Crumble the bacon on top and stir to combine. Whisk together the vinegar, olive oil, mustard, parsley, sugar, paprika, salt and pepper. Pour immediately over the potatoes and stir well to combine. Serve immediately, warm, or chill until ready to serve. If you're a regular reader, by now you know I’m a sucker for German food. But give me German Potato Salad, and I’m over the moon! My grandmothers – both German, natch – make their own equally delicious versions of potato salad. Legend has it my parents discovered me sitting in my car seat one day, fistfuls of potato salad in hand and my face covered in food. Legend also has it I would stand by my grandmother while she chopped up fresh potatoes, waiting for a bite of a raw piece (yes, raw potato – I was a strange kid). It’s safe to say I’m a potato salad girl. To this day, I cannot pass up the opportunity to make or eat potato salad at any occasion. And with summer in full swing, it’s the perfect time to make one of my favorite foods for a picnic, potluck, Fourth of July party (hint, hint) or just because. This German Potato Salad is particularly easy to make, in my opinion, because it requires no peeling of the potatoes and only five ingredients. It’s also relatively healthy, too, minus the bacon bits – but a little bacon never hurt anyone. Some might be surprised at first by the vinegary taste of the salad, but trust me. Over time, the vinegar soaks up into the potatoes, yielding a delicious sweet-tart flavor. The green onions add extra zing, and the bacon – well, it’s bacon. Enough said. 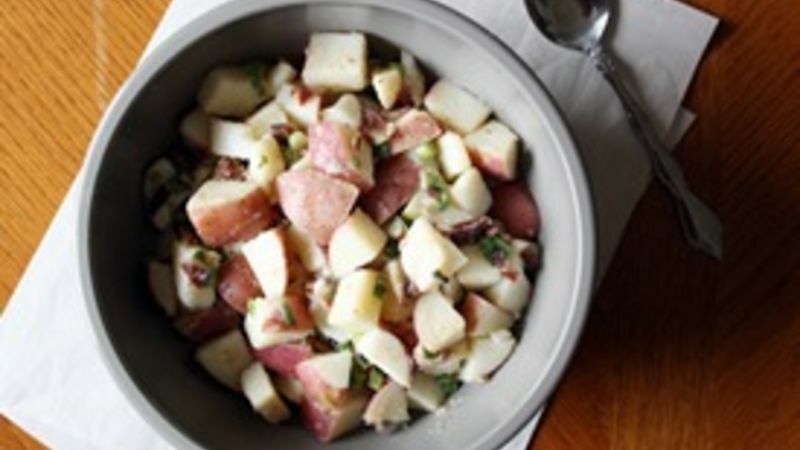 I love red potatoes in potato salad, especially with the skins left on, though you can use any type of potato you want, including Russets and Yukon Golds. This is definitely a “to taste” recipe, so feel free to add as much or as little vinegar as you want, as many green onions as you want and, of course, as much bacon as you want. Or, add some extra ingredients to the mix. It’s all good.